Potty Mouth helps dog stop eating his own feces. 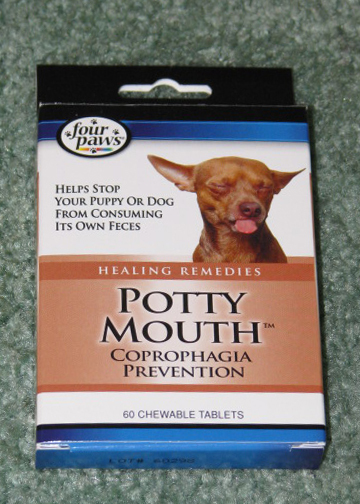 Potty Mouth helps your dog or puppy stop from eating his own feces. Potty mouth helps prevent coprophagia. Box contains 60 chewable tablets. Four Paws Product. Ingredients: Brewers Yeast, Cayenne, Biotin, Vitamin B1, Vitamin B2, Vitamin B6, Niaciamide, Iron and Copper. Directions: Feed your dog or puppy one tablet for every 10 lbs of body weight every day for 2 weeks. If problem continues double the dosage for two more weeks. As a preventative treatment continue to feed the dog one tablet a day.